Very funny, ludicrous amounts of fun, and with a surprising injection of just the right amount of heart, Penguins Of Madagascar does right by its title characters. 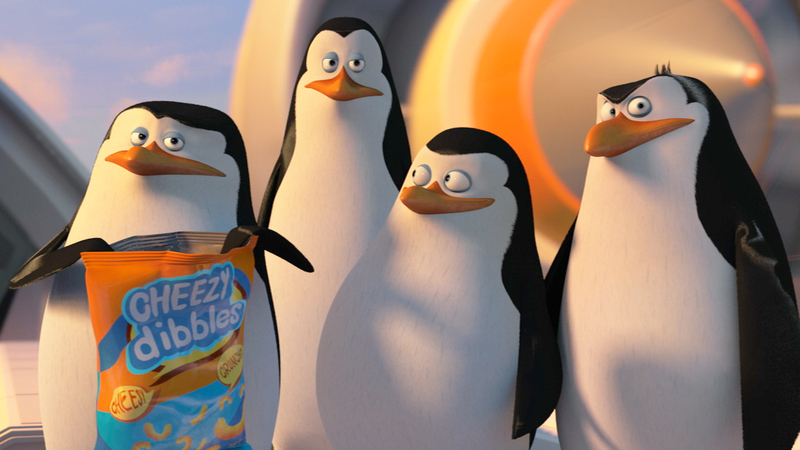 …or they can be Penguins Of Madagascar. Look, Penguins Of Madagascar does not reinvent any wheels, it does not push any boundaries, it does not attempt to dazzle the eyes with outstanding visuals, it does not try and make any bold statements or messages you won’t have heard from a million animated films beforehand. It knows this and it’s consciously not trying to do those things. What separates Penguins Of Madagascar from your Nut Jobs and your Planes and your House Of Magics is fun. Real fun. Penguins’ mission, above all else, is to be tonnes of palpable fun. This is lightweight stuff, but it’s not soulless stuff. There is effort and attention and love here; a desire to create real fun. Or, to put it another way, it’s the difference between Crank 2: High Voltage and a crappy Steven Seagal vehicle, between The Avengers and Transformers, between The Hunger Games and Divergent. One is farted out with the sole intention of box office dollars, the other knows exactly what it wants to be and goes about fulfilling that ambition and intention with style, energy, affection and sheer stick-to-it-iveness. Based on the spin-off TV series of almost the same name but set in the timeline of the films – if this sounds confusing, fret not as the film’s attitude towards this mishmash is encapsulated perfectly by the kid-focussed prologue being dated as “Some Years Ago” – Penguins follows the scene-stealing Penguins from the Madagascar series. There’s Skipper (Tom McGrath) – the leader who is committed to his team and doesn’t like his authority being questioned – Kowalski (Chris Miller) – the brains of the outfit and a propensity for bluntness – Rico (Conrad Vernon) – the near-silent and crazed demolitions expert – and Private (Christopher Knights) – a lone egg the rest of the team rescued and welcomed into the group as one of their own, and who wishes to be seen as a valued member of the team. On the eve of the final performance from Madagascar 3, the Penguins choose to celebrate Private’s 10th birthday by breaking into Fort Knox and treating him to a packet of Cheese Dibbles. The event turns out to be a trap, however, and the team are captured by the evil octopus Dave (John Malkovich) – who also moonlights as a human scientist named Dr. Octavious Brine, it’s nicely ridiculous and genuinely rather a bit creepy – who, fuelled by years of resentment of being overshadowed by cute and cuddly penguins that started when our lead quartet were first installed at Central Park Zoo, has built a penguin-focussed super-weapon with evil intentions. The Penguins resolve to take Dave down, but end up having proceedings complicated by the arrival of interspecies task force The North Wind – led by the egotistical glory-hogging Classified (Benedict Cumberbatch). The plot is really not any more complicated than that and all of the expected beats are hit at the appropriate times. Certain scenes are more than a little forced, especially the attempts at book-ending the film, but it still all works because these beats are used as jumping off points for jokes, fun and heart. The obvious scenes – the tension between the two teams, The All Is Lost Moment, the point where Private steps up – are executed with genuine sincerity, the feeling that these scenes have been used because they are what best helps and best fits the story rather than obligation or “this is what we need to do in order to print money”. That is not to say that Penguins Of Madagascar is overly serious. In fact, quite the opposite. This is silly, light-hearted, fast-paced nonsense. But the film is serious in its desire to entertain. Hence why it goes all out in the action sequences. A gondola chase in Venice takes a sudden detour on land, the opening rescue of Private’s egg moves with speed and high energy, whilst the final setpiece shrinks the scale and minimises the carnage but still feels noticeably climactic and high-stakes. The standout, though, is an alternately hysterical and technically jaw-dropping one-take sequence in which the Penguins make a sudden exit from a cargo plane taking them to an assigned safe-house and attempt to find a different ride or a safe landing. It’s crazed and fast and incredibly fun, which sums up the film’s overall feel, to be honest. Pure, undiluted fun. Incidentally, whilst I’m on the subject, that one-take free-fall sequence is the only time the animation truly stuck out to me. The Madagascar art-style is very much set in stone by this point and there’s been no real majorly noticeable technical upgrade between films to make proceedings stand out. Storyboarding and layout is decidedly unspectacular, so the film ends up sliding comfortably into the Madagascar canon without really amazing the eyeballs. This is fine – as again, the film isn’t trying to astound the eyeballs, and visuals that are too good-looking would likely distract from the intended mood – but it does make the one-take sequence stand out even more, as the film doesn’t really try to match that kind of scale or ambition again. It is insanely cool, mind, so try not to read that as an insult. Anyways, as mentioned, Penguins is major amounts of fun. The whole film carries with it this light, energetic kind-hearted feel. The film is never mean-spirited, never overly-dark, never sacrifices its heart or nicer kinder characters for a quick laugh. There’s clear love and affection going on here, a real desire to cut loose and have fun with the premise as much as possible. And that fun is incredibly infectious. From about minute number 2 – when the title cards disappear – to roughly minute 86 – after the mid-credits stinger has finished – I had this big goofy grin plastered on my face and it only wavered for the few moments where the film gets some semblance of serious. That’s as good a segway as I can think of. So, the heart. Penguins has one. It has a big one tattooed on its chest, powering proceedings. The dynamic between the Penguins is what keeps the film going, keeps that spirit up. The group are always true companions with one another and this fact is constantly underlined and reinforced. The main conflict of the film – which is not Dave, although he is the catalyst for it, but is instead Private’s desire to be seen as more than The Cute One in the eyes of Skipper – comes from a place of genuine underestimation and obliviousness, rather than meanness, which is precisely why it works. It’s in character, at all times, and that enables the film’s final third – where said heart bursts through front and centre without overcooking or schmaltz-ifying the film – to connect way harder than it seems like it would. Other than that, the jokes are of the ridiculous silliness variety, albeit silliness rooted in character work. There’s no random silliness for random silliness’ sake. The “River dance!” gag is based on the Penguins believing Shanghai to be Dublin, for example, whilst Dave’s attempt at a video call works both on the base level – the increasing frustration of the team, the mundanity of the situation – and a character level – the guy may be competent with evil plans but he is utterly useless at pretty much everything else – and there are a pair of gags in the film’s final third involving The North Wind and a giant explosion that work extra-well because of Classified’s prior characterisation. There is also a bunch of toilet humour, mostly in the form of pure groaners, but the film’s rapid-fire pace ensures that a gag that doesn’t work will be followed up by five or so that do soon after. Also, the film openly calls out how irritating “I Like To Move It” and “Afro Circus” are during our first present-day scene, and I am perfectly fine with pandering when its aimed at me and completely deserved. Since Penguins Of Madagascar is primarily a comedy, I’m resisting awarding it top five-star honours for now – because pure comedies, ones like this, I also judge on how a second viewing treats them – but I can still comfortably place this film in the highest echelons of the year’s animated films. If The Lego Movie is at the top of the pile, and The Nut Job resides in Sub-Basement 5, then Penguins is currently sharing the number 2 slot with My Little Pony: Equestria Girls: Rainbow Rocks and that number 2 slot is just a whisker away from The Lego Movie. This is an incredibly funny, incredibly fun, surprisingly heartfelt animated film, and living proof that not aiming for the stars does not automatically mean “cheap creatively-bankrupt piece of crap” and does not mean that trying is optional. 2014 has been a really miserable and disappointing year for animated features. Penguins Of Madagascar proves that we can have it better and that we don’t need to re-invent the wheel in the process. Callum Petch is heading into twilight, spreading out his wings tonight. Follow him on the Twitters (@CallumPetch) and listen to Screen 1 on Hullfire Radio every Monday at 9PM BST (site link)!